As a wedding planner in Chicago, one of the main reasons people hire us is for our innovative ideas. Well we can’t do it all alone, and today we have one of our talented colleagues chiming in on her area of expertise. Kara Underwood of Magnificent Milestones is filling us in on some of her favorite trends in wedding paper! Calligraphy: Calligraphy isn’t just for the envelopes anymore! Couple’s are making their invitations truly one-of-a-kind by having a calligrapher provide artwork (their names, their monogram or the entire suite) that is made into a plate for the printing process. Die-cuts: Shapes and patterns are pretty in print, but they make an even bigger impact as the actual shape of an invitation and inserts. Kraft paper: Whether it is a rustic wedding or a summer engagement party, kraft paper (particularly envelopes) go hand-in-hand. 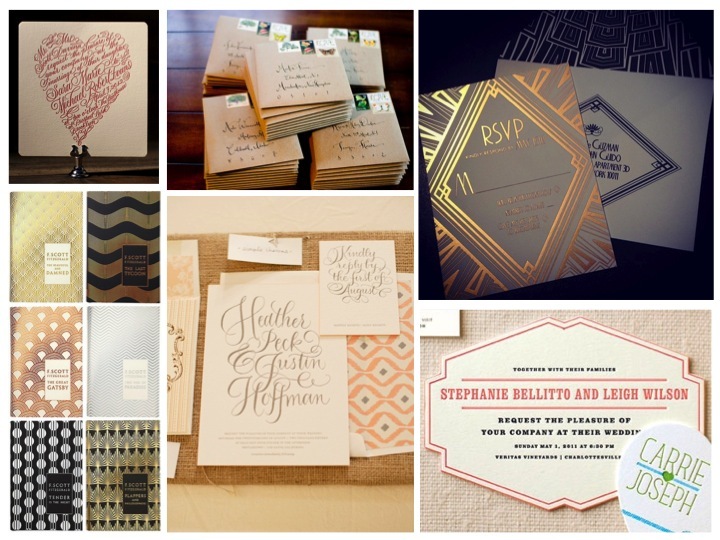 Art Deco: With the debut of The Great Gatsby and popular shows like Downton Abbey inspiring wedding style, we have seen a resurgence of art deco styles and fonts (and couldn’t be more jazzed about it!). To get direct links to products featured and to check out more invitation ideas we love check out our Pinterest board: Invitation Innovation.